“We do not preach only one coming of Christ, but a second as well, much more glorious than the first. The first coming was marked by patience; the second will bring the crown of a divine kingdom. These words mark the anticipation of the Christian life. We sit between two comings of Christ, and, St Cyril reminds us, when the Lord comes again, it will not be clothed in silence in a manger. At the second coming, there will be no mistake that the Lord is here. But in our waiting for that day that only the Father knows, what is our attitude of waiting? The first disciples of Jesus thought that the Lord would return in their lifetime. They committed all their resources to getting the word out, proclaiming the Messiah, Jesus of Nazareth. As one Disciple after another began to die, it made them wonder, where is the Messiah? Isn’t He coming back soon? Urgency turned to hesitancy. Many possibly returned to their previous lives. Their vigilance turned its energies to ordinary tasks. To have such a capacity comes from a life formed by prayer and worship. For these require discipline which also prepares the heart for hardship and difficult choices. Do we have such an attitude that will sustain our waiting? Are we willing to wait in patience and vigilance, without letting hope of His coming die in our hearts? Come Lord Jesus! Come soon! We received a very curious Christmas card. 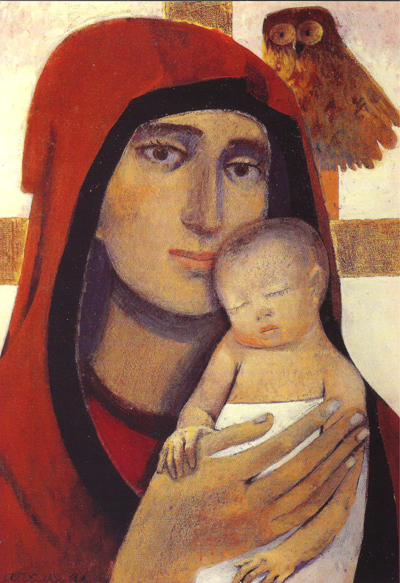 Mary is tenderly holding the sleeping Christ child, her veil a crimson red. Behind her is the cross, and an owl peering out from over her shoulder. It is not unusual to have Mary caressing her newborn infant Son in greeting cards at Christmas time. However, the imagery around the Mother and Child seem all wrong. Mary is dressed in red. Red often stands for the Holy Spirit, but it also represents blood and suffering, of Christ’s passion and of martyrdom. Placed in the context of the nativity, it reminds us that this is no ordinary child being held by a mother. Her garment is a foretaste of the sword that will pierce her heart. How do I respond to such a question? Who am I? The Gospel passage begins by describing John as one “…sent from God. He came for testimony, to testify to the light, so that all might believe through him” (John 1:6). Is this also the role of every follower of Christ? To give testimony to the Light, which is Christ? To be like John, allowing ourselves to become less and less, as those to whom we testify grow in their knowledge of Jesus (ref. John 3:30). 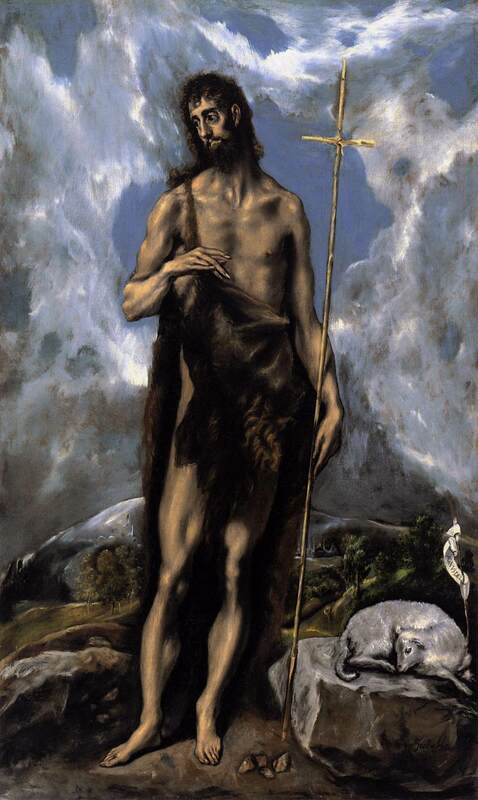 John the Baptist is a reminder for us, a contrast to the way the world would like us to see reality. His austerity tells us, all his attention is upon the “one among you whom you do not recognize…whose sandal strap I am not worthy to untie” (John 1:26-27). Our world is uncomfortable with such a message of self-depreciation, and even more so with a messenger that points to Christ by the very way he lives his life. It is not possible for a person to live with such conviction if they are not certain of who they are. Here’s a brief ‘retreat’ for you (thanks to Ruth – from the Pulpit of her Life) to remind us all to slow down a little bit in our anticipation of the Christ-Child. These four precious weeks before Christmas – Advent – is a time to step back and prepare our hearts to receive the Christ-Child. Are we ready to receive Him? What if you were waiting for something that would change your life? How would you get ready for it? How are you getting ready now? God of power and mercy, open our hearts to wait. Remove the things that hinder us from listening in the silence. the things that keep our hearts from pondering Your love. our relationship with You has changed our life forever. I just came across this series thanks to a friend of mine, and I liked it so much I thought I’d share it as a resource to all my readers with children (and, for all you adults out there – like me – who are children at heart!). The preparation began this last weekend, but it’s still not too late to start this Advent project with your little ones. Day One – Explanation of the Jesse Tree Project and Resources. Day Three – Tuesday the 30th: the sacrifice manger (above) and the second part of the story of creation. “This third Sunday is called “Gaudete Sunday.” “Gaudete” means rejoice, so this is the Sunday when we can lighten up a little on the penitential aspect of Advent and rejoice that the Savior of the World is almost here…If your children have been doing some sacrifices, they can really feel the difference today if you do some fun Christmas preparation. “Today the video is about St. Lucy. We also mention “Gaudete Sunday” and a bit about this Sunday’s Gospel, which again centers on John the Baptist. Let me comment a bit on both the above. “During the last seven days of Advent the antiphons are called the “Great O Antiphons,” because they each begin with the exclamation “O” and then a plea for the Messiah to come. Each “O Antiphon” invokes the coming of Christ by titles derived from Old Testament prophecies.” Click the link for more interesting information. “When we arrange the gifts around the Christmas tree, the tree becomes a symbol of the Tree of Life, a figure of Christ, God’s greatest gift to all man.” P. John Paul II By blessing the tree, it ceases to be a pagan symbol, but a symbol of Christ. “For Catholics, Christmas begins the night of Christmas Eve and continues until the Feast of the Baptism of the Lord, when Jesus’ public ministry begins. (Yes, when you count all the days up, that’s more than 12 days! )” Click the link to find out more. * Octave of Christmas: Dec 25 – Jan 1 —every day is celebrated as a Solemnity! It’s all just like Christmas Day! * Dec 26: Feast of the Holy Family. * Dec 27: Feast of St John, Apostle and Evangelist. * Dec 28: Feast of the Holy Innocents, Martyrs. * Jan 1: Octave of Christmas – Solemnity of Mary, Mother of God (Holy Day of Obligation). * Jan 2: Epiphany celebrated in the United States (Epiphany traditionally is Jan 6, after the 12 Days of Christmas). * Jan 3: Feast of the Most Holy Name of Jesus. * Jan 9: Feast of the Baptism of the Lord (end of the Christmas season). Also, there are a lot of other catechetical resources at the site, including a daily rosary: you can click the green arrow and participate in the daily rosary with the children. As we enter into this season of wonder, let us pray our children come to know the deep reason for the gift giving is because of the eternal gift we have in our Lord Jesus. Pope Benedict will hold a prayer vigil for unborn babies on Nov. 27, the evening before the First Sunday of Advent, at St. Peter’s Basilica in conjunction with Vespers for the Start of Advent and he is requesting that parishes, religious communities, associations and movements the world over host vigils in communion with him. This Vigil for Nascent Human Life, which has pro-life leaders rejoicing, will be held after Vespers for the Start of Advent. EWTN will televise both celebrations beginning at 11 a.m. ET, Sat., Nov. 27. The Pope said he will pray for the unborn and their parents, for an end to abortion and research that destroys embryos, for recognition of the dignity of every human life, for the overturning of laws that permit the destruction of innocent lives, and for the healing of those who have acted against innocent human life. Advent begins this Saturday night…candles in churches and homes will be lit…and prayers will be prayed. But this Advent will be different in its introductory tone in many Churches around the world who have pledged to pray in union with the Holy Father, Pope Benedict XVI for “All Nascent Human Life”. The Pope has made an unprecedented request to all Bishops around the world to reserve first vespers on November 27th for the specific intention of all life on the verge of coming into existence. The Unborn. The timing for these prayers for children not-yet born, sets the tone for our anticipation of the Christ-child anew. It is also a reminder to us that our Lord, too, began His earthly life in a precarious state of complete dependence upon a woman for all nourishment while being carried for nine months in Mary’s womb. Advent turns our gaze to the anticipation of His coming, and preparation of the great feast of Christmas, and yet, it is the anticipation with the Christ child for the birth of every child. Are we ready to welcome him? 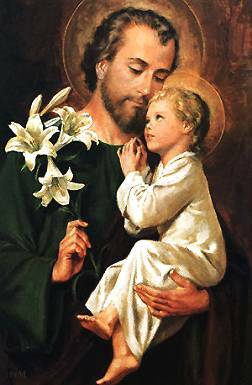 Let us prepare our hearts for the Lord, in our prayers for every child in waiting to be born. Prayer materials have been developed by the Congregation for Divine Worship and the Discipline of the Sacraments and the Pontifical Council for the Family, and are available on the USCCB Pro-Life site. You may also feel a desire to write a note of support of this project to the Pope at the Yes! for Benedict website. Fr. Z explains the word nascent very well.